Brisbane’s hot and humid weather had urged me to start making some cool summer tops! 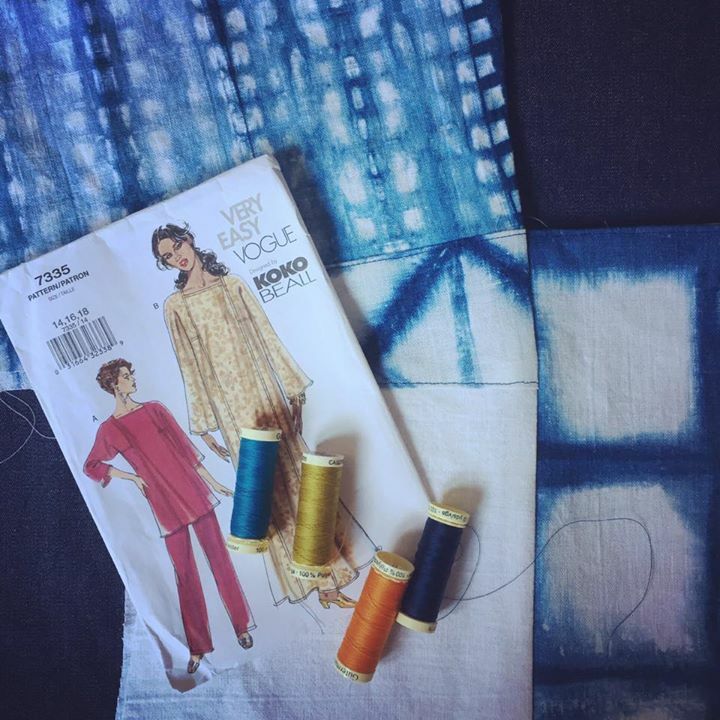 First one is a linen top made using squares of Shibori dyed fabric that I made during a workshop last year when we had an indigo vat on the go. The pieces of fabric I am working with are all 50cm x 50cm as I had planned on using them for cushions. I am using a Very Easy Vogue pattern that I found in my pattern stash. (Someone gifted it to me a while ago.) I like the clean lines and simple construction. The smallest size on the pattern is 14 and I am usually a 10 or 12 in tops so I have reduced the size. I am about half way through sewing and had hoped to finish it this afternoon so I could post the finished product but had some custom make sewing to get done too. I am unsure about top stitching… I am itching to add some bright pops of coloured stitching but can’t decide! I guess I get to sleep on it which might be a good thing. Julie runs most of the workshops at Ministry of Handmade. Over the years she has studied design, knitted, crocheted, made quilts, recovered lounge suites, renovated four houses, made furniture, refurbished lampshades, made curtains, done clothing alterations for boutiques, spun wool, assembled short runs of garments for award winning fashion designers, themed events and published books.